This last trip to NYC I had my camera of course. And what captured my imagination as I wandered about the Village and Chelsea and Soho were wrought iron railings. There are so many different shapes and patterns. What I find inspiring about them is what they represent - a time in history when something as simple and utilitarian as a railing would be bent and twisted and shaped into something beautiful. A time when it was important not only to build something that worked but something that was lovely to see. Form DID follow function. 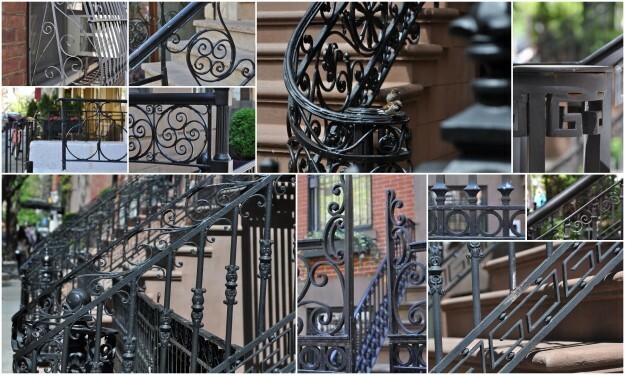 When I was looking at my photographs of wrought iron railings I felt inspired by their shapes. One in particular grabbed my imagination. This one. What drew me to this particular wrought iron was its rough texture. You can see that over the years rather than sandpaper down the rust, it was just painted over and over until it became swollen and lumpy. I also had a plain pillow that I had bought at ABC Carpet and Home and thought that I would marry the two. Here is what I did. First I gathered together my materials - the pillow, freezer paper, my cutting board, a ruler and a knife. I drew a copy of the pattern by hand. I didn't want it to be perfectly in proportion as I wanted the pillow pattern to also have that rough, swollen, lumpy outline. I cut out the stencil, ironed it on and painted it with opaque fabric paint. I brushed a thin layer from the outside edge inwards to minimize any paint seeping underneath the stencil. The paint went on looking quite greenish but dried more of a bronze colour. Have you worked with freezer paper before? It's so easy to use. And here is the finished product. I am going to put it in the basement in the tv room. The entire room is an ongoing project that I'll share with you in a month or so - let's just say that the before is as bland as you can get. The ultimate in matchy-matchy. I am pleased with how it turned out - it's a souvenir from my NYC trip that doesn't scream "tourist". And it's always inspiring to make something with your own hands, right?